Don’t let this synthesizer’s size or single oscillator put you off, this synth has quite a lot of tricks up it’s sleeve! Manfred Fricke Berlin, a modular synth producing company that in the last years has joined the modular-synth market by creating modules like we know and love from Doepfer and similar companies like Analogue Systems, has been releasing some semi-modular synths like the Microzwerg, Megazwerg and the smallest and lightest of the bunch; The Nanozwerg. 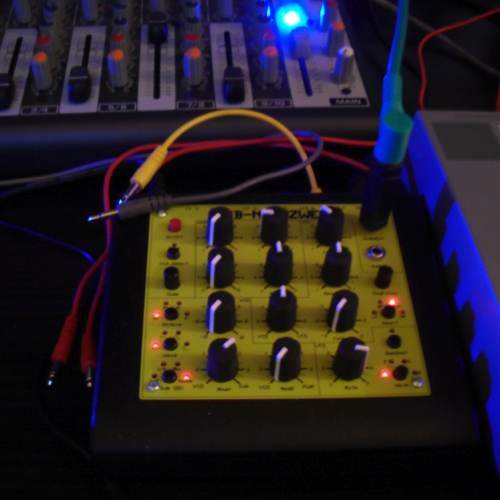 The Nanozwerg has a single oscillator (triangle, saw, square, pulse), a switchable filter (low-pass, band-pass, Notch, High-Pass), a single LFO (triangle, saw, square, sample & hold), a knob to modulate the filter with either LFO or VCO, a knob to modulate the oscillator by itself (VCO) or LFO, some patch points and a sub-oscillator to fatten-up your sound. The Sub OSC also includes a Noise generator which makes it possible to synthesize non-harmonic sounds like drums. Pretty standard synth stuff, and the reason why I bought the thing in the first place. But here comes the fun part..
.. OK! One more! Use the Sample and hold from the LFO as a sound-source (LFO out -> Audio in) for that 8-bit burning sound from the old days. In short, if you have a modular system this might not be interesting for you: The filter is only 12dB per octave, there’s only one (normal) oscillator, it’s monophonic. But if, like me, you’ve just started making your journey into analog, this is a great place to start. It’s pretty cheap (Around €215,-), it’s more powerful than any competitor (Dark Energy, Mopho etc.) and KORG DS-10 users will feel right at home using this synthesizer. Somehow it even reminds me of the software.